Breakfast can be the hardest meal to actually cook and make nutritious. Regardless if it’s supposed to be the most important. I don’t know about you, but when my toddlers are hungry and tired- they are an even bigger handful! Breakfast for one year old toddlers is essential. They have tons of energy, are growing quickly and learning so much throughout the day. Especially my little one. He’s already spirited so it’s important that his first meal of the day is filling, nutritious and gives him a great foundation for the day. The problem is that I am still half asleep and my coffee hasn’t set in yet at breakfast time. On top of that, we are usually running late for school because this girl is not a morning person. Not the best setting for a great meal. I’ve been working on this lately and did a breakfast meal prep, so I had some already made nutritious meals. In addition, we’ve been trying some new foods to keep the variety interesting. Breakfast foods are also good at any time of day! So you can use these for lunch and dinner as well. 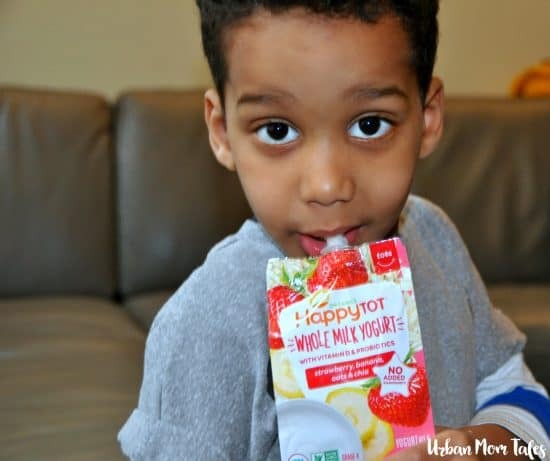 I’ve partnered with Happy Tot yogurt to bring you this post and I was so excited when I found this yogurt to add in our rotation! You know I made my own baby food and I’ve been careful (or anxious) about introducing too much sugar in our sons’ diets. In the beginning, I researched formula brands to make sure we were buying a brand with no added sugar and have avoided introducing sugary cereals. The sad part is that it also included avoiding yogurts, because even though they are healthy- there was tons of added sugar. My boys love these! It’s a win win for all of us. 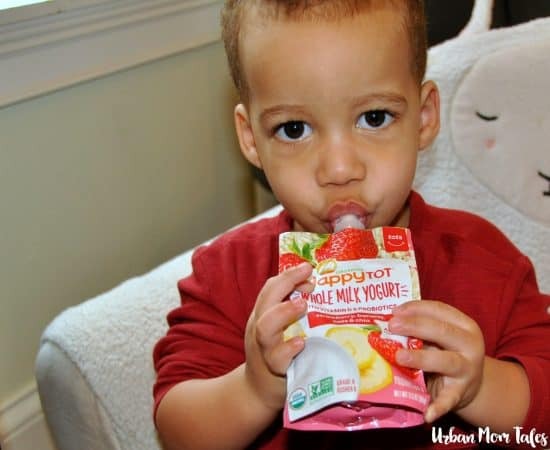 The loved the taste and eating out of pouches in general :-). And I don’t have to worry about sugar since there is none added or other ingredients since they are non-GMO, organic and made with probiotics. The only negative is that I didn’t find these when my boys were younger because they also have a baby yogurt variety. Needless to say, we have incorporated them into our meals. Many people have appreciated finger foods for one year olds and I wanted to take it a step further. Moving beyond finger foods to include some awesome meals that are still easy, but more versatile. 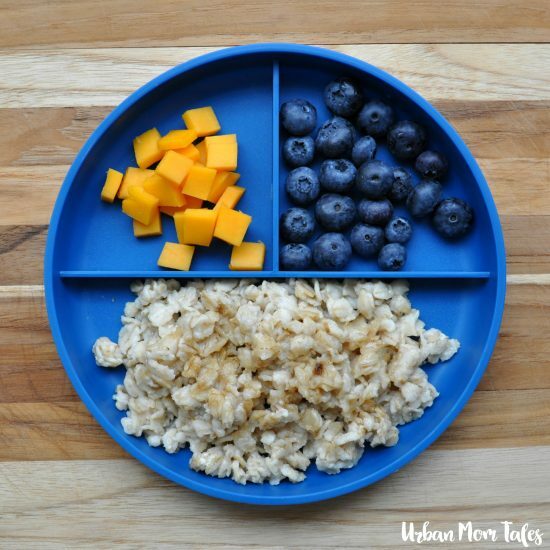 These are some of our favorite breakfast meals for a one year old and I hope it gives you some ideas that you can make right away. As with every meal, our main goal is to aim for multiple food groups in breakfast dishes. 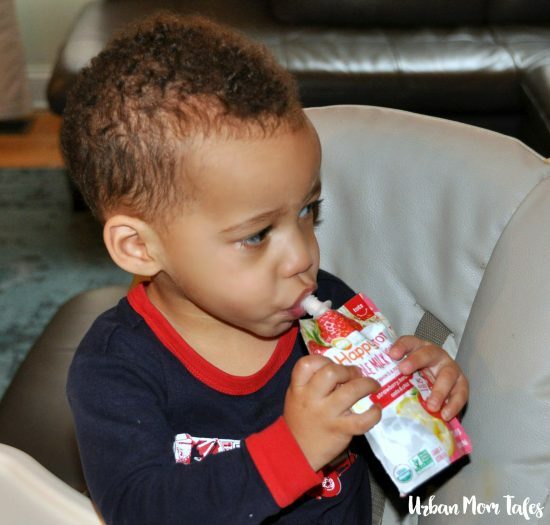 Helps toddlers get all their nutrients and stay full longer. Finger foods are convenient in the beginning and we still do lots of “snack” meals. Ellis is 21 months now and is very skilled with his silverware. It can get frustrating and messy, but having them practice early helps develop their pincer grisp and thus ability to feed themselves. Pickiness happens. But they go in waves. Keep trying to offer new foods and foods they didn’t like in the past; they may surprise you by changing their mind. Of course, it goes the other way too. I’ve had to remind myself to not take it personal when one of my boys doesn’t eat something I put a lot of work into making. Fruit is always a win with my boys, vegetables on the other hand- not so much. Sneaking them into egg muffins, scrambled eggs, muffins or green smoothies helps ease my mind that they are getting at least some green produce in their system. 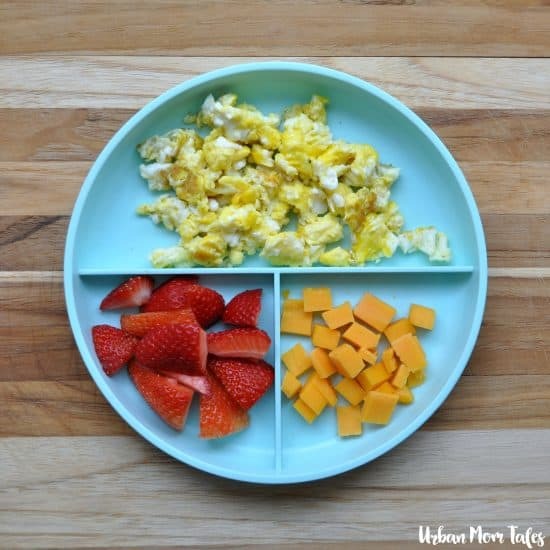 Scrambled eggs, strawberries, and cheese. Scramble in some vegetables (what we usually do) and add a side of whole wheat toast to cover all your food groups! 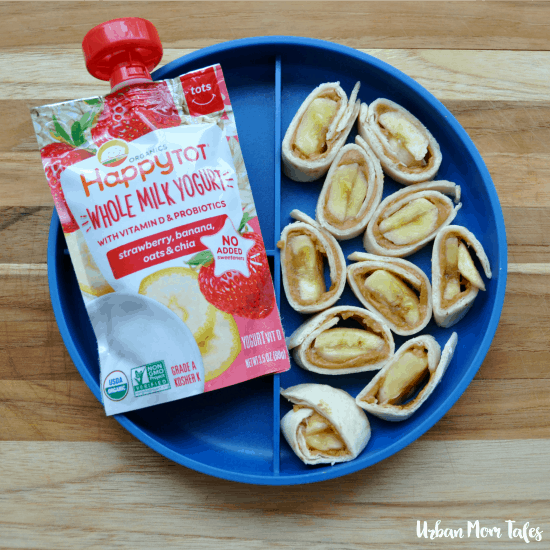 Banana and peanut butter roll ups with a side of Happy Tot Yogurt. 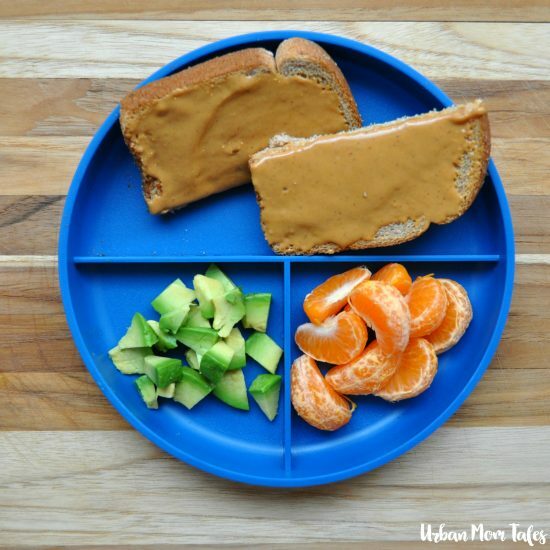 Nice alternative to toast and kids love how easy they are to eat. This is the Texan in me. Breakfast tacos are so so yummy. You can include scrambled eggs, bell peppers, tomatoes, avocado, beans and salsa. Served with banana and a Happy Tot yogurt. Oatmeal is a favorite around here. We also love these oatmeal muffins and eat them often. Served with cheddar cheese and blueberries. Green smoothie- has your fruit (banana and frozen strawberries), veggie (spinach), dairy (Happy Tot yogurt) and protein (peanut butter). Add some ground flaxseeds for extra nutrients. Peanut (or any nut) butter on whole wheat toast, avocados and a cutie. *My son is about 21 months and he can eat the cuties like this now, but I used to cut them in half for at least 12-18 months. 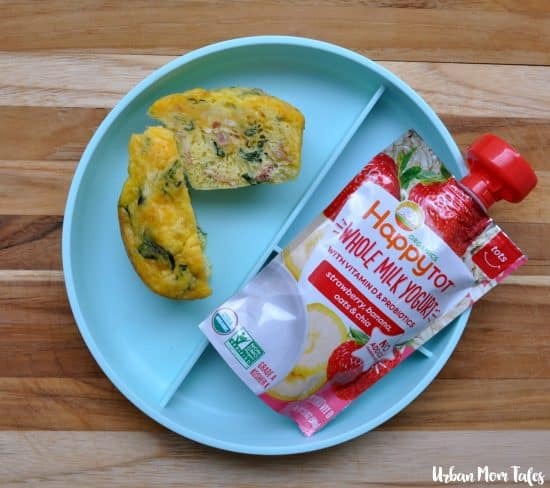 Egg muffin made with cheese, bacon and spinach and a side of Happy Tot yogurt. *These muffins are from my breakfast meal prep. Just grabbed one from the freezer and microwaved for 45 seconds. Yogurt parfait- greek yogurt, fruit, granola, flaxseed and a little honey. Banana and sweet potato muffins– these are super yummy and healthy. I used super ripe bananas and left out the sugar. Sweet enough still! Serve with a side of turkey sausage and yogurt. Whole grain bagel with cream cheese, fruit and hard boiled egg. Oatmeal muffin, has oats and fruit. Serve with a hard boiled egg. Whole wheat pancakes with applesauce. French toast sticks with maple syrup, fruit and bacon. 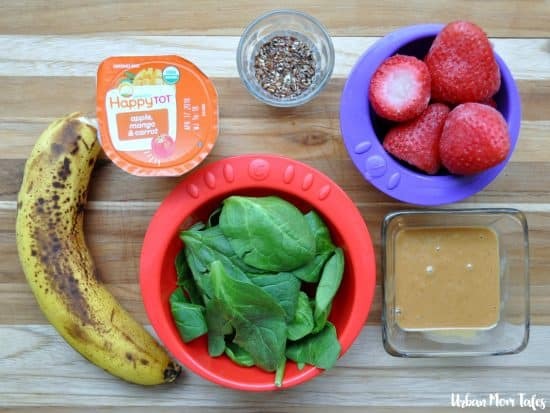 Smoothies– lots of varieties you can make. 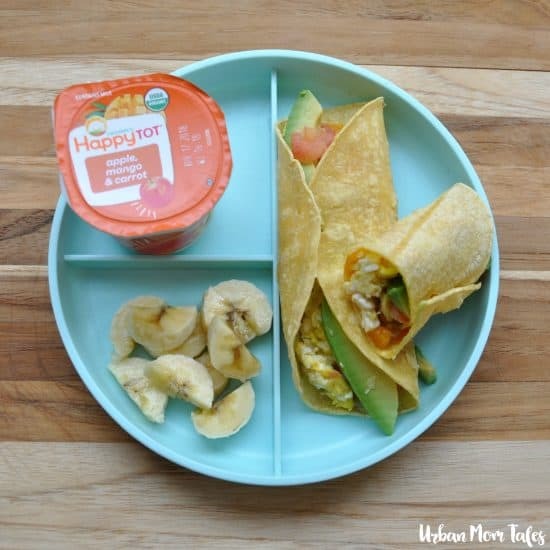 Egg quesadilla, omelet or frittata- lots of ways to get creative with eggs since they are such a great protein source and an easy place to hide veggies. 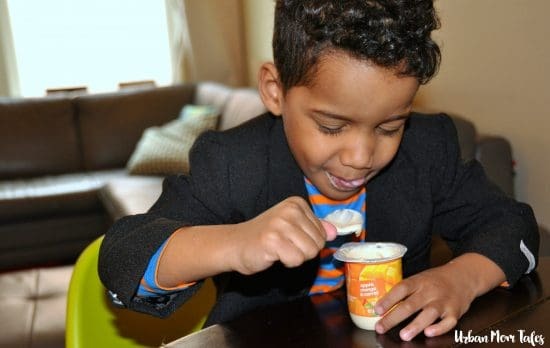 Find Happy Tot Yogurt at Target or your local grocery and click through to download a coupon! Thanks! This is a great list! We’ve been stuck in a rut with breakfast lately haha. Where did you get those plates from? Thanks for the link up for the Sweet Potato Banana Muffin recipe.